It’s the “social” event of the year! May 2, MLC Day, will be a day of celebration for our college and all who support our ministry. 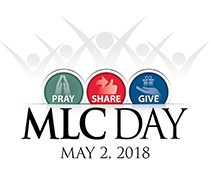 With an emphasis on communication through social media, MLC Day will allow supporters across the globe to follow our activities online, share our message with friends, pray for our work of service to the world, and give to support that work. Consider having your own MLC Day at your church or school and sharing a video or photo on our MLC Day page and Facebook newsfeed! Visit mlcday.com to learn more!